It’s Fridaaaay, everybodaaaay get craaaazaaaay! After this busy week that’s exactly how I feel. Time to break out the wine and celebrate that it’s finally over! Ha! When the weather starts to warm up I like to trade my red wine for something a little colder and a little more refreshing. Our favorite for the last couple of years has been Moscow Mules. Last year I even made B a Moscow Mules gift basket for Father’s Day and he loved it… I think it was one of my favorite gifts that I ever gave him. Ever since, we have been enjoying these delicious drinks at home and last week was no exception. It’s so nice to kick back on our back porch and drink one of these yummy concoctions! You can find the gift basket idea as well as the recipe that we use here and the exact copper mugs that we use are here. They are on major sale right now! Our back yard backs up to woods so we have complete privacy. Because of this, we never covered our back door because it’s just not really necessary. However, I’m a super paranoid person and for the last seven years it’s always bothered me at night because I always feel like somebody is watching us. Lol. It doesn’t bother me that much when B is home with me, but when he’s out of town for work I can’t even stay downstairs alone after it gets dark because it makes me so uncomfortable. At the beginning of the year, I knew that B would be going out of town in February, so I finally contacted someone about installing a shutter for the back door. They had to build a custom shutter which had an ETA of 6-8 weeks, but they ended up forgetting to place the order, so the shutter didn’t end up being ready until April. Sigh. I ended up being without a shutter when B was out of town that week, but a couple of weeks ago they finally came and installed it. After they left, I opened the shutter and realized that they had installed it backwards. Instead of the shutter opening the same way as the door, it opens the opposite way which means that it covers the doorknob when you open it. Sigh. So they are now ordering another one and we have to wait several more weeks for them to come and fix it. While I’m over the fact that we had such a rough time with them, I am LOVING having a cover over the back door at night. When B was out of town this past weekend, I happily enjoyed a glass of wine and How to Lost a Guy in Ten Days alone on the couch downstairs, and I wasn’t the least bit skittish about being alone. Not to mention the shutter makes the house look so much more elegant! It’s gonna be great once it’s installed correctly! The other morning at work I got the most hilarious text from my friend Jeannine. Her son who is Olivia’s age, had been asked to make a picture of his family at school. Well, in his picture he included his mom, his dad, his brother, his dog, and… Jacob. My Jacob. Haha. Jeannine said that he talks about Jacob all the time and is constantly asking about him, so I guess in his mind he’s family. It cracked me up but it was also the sweetest little thing! My Mother’s Day gift from Brian and the kids was a printed certificate telling me that I can pick out a bar cart! I have been wanting one for about a year now so I am thrilled to my little toes. F I V E – Countdown to the BEEEEAAAACH!!!! We are just weeks away from our trip, and I could not be more excited to have my toes in the sand and my skin in that saltwater air! 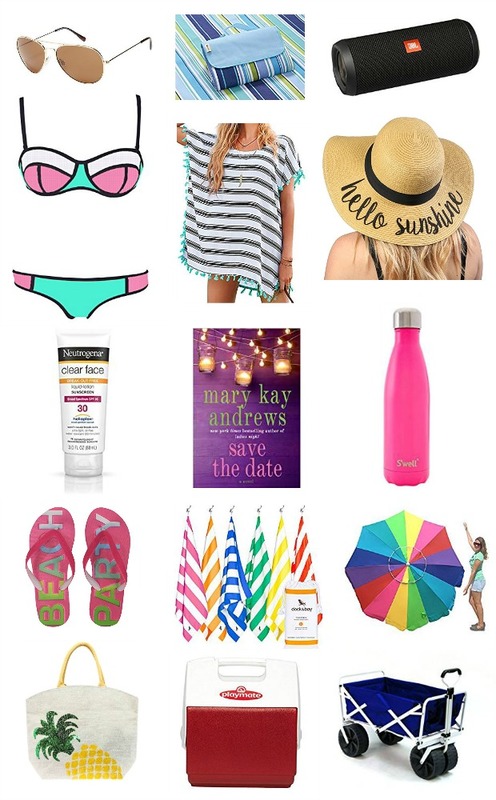 I rounded up all of my faves for the beach in this post last week. Did you catch it? I ordered this hat from my own wish list and it should be arriving any day now! It also comes in ten other sayings. I was torn between this one and Always on Vacay. I also bought two of this beach coverup to put in the beach-themed gift basket that Jacob’s class is giving the teachers as an end-of-the-year gift. I hope they love them! If you want to see the complete post for my favorite beach picks, click here. Here's a little peek at what's over there! Well everybody, do enjoy your weekend! It’s going to be beautiful here, so I know we’ll be enjoying ours! That text is hilarious!! I would have laughed so hard if jack had done that. Yay for the beach. Love all of those items! Especially the hat! Have a great weekend! Yay for the beach and all the fun stuff. Bummer about the shutter but it looks great!! I love moscow mules, too. They are just so refreshing - perfect for warmer weather! I would totally need something covered a door like that, too. Our mind just plays tricks on us with things like that and mine would be running wild. Happy Friday! OMG how cute that your friends son added Jacob to their family!! So sweet!! I still haven't had a moscow mule!! Happy Weekend friend! That is so funny and cute about Jacob being added to your friend's family. Kids are so funny. We have never made Moscow Mules at home but we should try. They would be so yummy and refreshing this summer while porch sittin'. Did they give you a discount for your shutter hassle? As your paranoid twin, I would totally think people are watching me all the time...That's why we get ready in the dark. LoL. I am loving that backdoor shade! I want those on all my windows!!! I dont even know what a Moscow Mule is - I hear about it - I'm going to have to look those up. I am still needing to try out the Moscow Mule thing! I have been on the hunt for a bar cart too-there was one on mega sale during the holidays and I didn't jump on it and by the next day it was gone. Definitely let me know if you find one!! That family picture is cracking me up- too cute! My daughter is obsessed with Trip's friends. I'm the same way about the windows- even though our backyard is gated and locked up, it still freaks me out that somebody could possibly be around. The shutters look great! Have a fabulous weekend! Oh my goodness, I laughed out loud to that text! haha! How sweet! I'm super excited to see photos from your beach trip! Happy Friday! Haha. Yep, it cracked me up, too! Yes, that is definitely a great way to end the summer! Go out with a bang! That sweet picture❤️, Love it!!! I'm also loving that adorable cover up. Have a great weekend!!! I really like that swimsuit. I don't need a new one but I'm wanting a new one & that one looks super cute! Moscow Mules are the best in the summer. That is a great text. So sweet that he thinks of Jacob as family. I want a bar cart as well, but I can't justify spending a ton either. You are going to have so much fun at the beach in a couple of weeks! That is so sweet that her little boy included Jacob! Love the shutter. When we bought our house there was a shutter like that on the back door and I loved it. We replaced the back door this winter because it was 50 years old and the glass in it was incredibly dangerous, but I do miss the shutter! That text cracks me up. Ha ha! Kids are crazy! Yay for the beach!! We are going to the mountains this year with my inlaws and I can't wait. Then I'm sure thenkids and I will head to the beach to my aunts house. Bring it on! Awhile back, we stayed with some friends for a weekend, before we moved here, and her son did the same thing - added my kids to his family drawing! I love that. That text is hilarious and so stinking cute. I guess he must really look up to Jacob. I hope y'all had the best weekend.